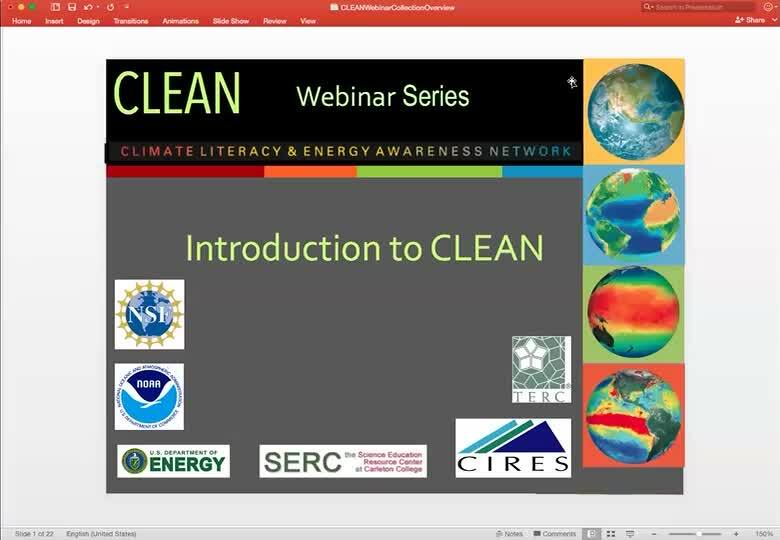 Take your teaching about climate and energy to the next level with the CLEAN Webinar Series. Use the buttons below to register for each free webinar. We also invite you to check out these partner webinars that are related to the CLEAN series. Webinar recordings of the event topics are posted below. Human impacts on the climate system are becoming increasingly evident, moving climate change from a topic that is abstract and faraway to one that is right before our eyes. It's our job to help students learn about our role in altering the climate, but it's important to do so in a way that's constructive and solutions-oriented. Educational materials from CLEAN collection can help you navigate this essential topic. Presenter: Karin Kirk, Geologist and Science Writer. In this webinar, David Easterling (NOAA/National Centers for Environmental Information), Technical Support Unit and a Federal Coordinating lead author on the Fourth National Climate Assessment (NCA4), will summarize the key scientific findings from the NCA4. CLEAN educators will discuss how teachers can use the NCA4 in their classrooms and point to CLEAN resources that support teaching these topics. This webinar, led by Deb Morrison (University of Washington) and Katie Boyd (CIRES), introduces teachers to CLEAN and offers an interactive tutorial of how it can help teach about climate and energy in the classroom. CLEAN has a collection of quality resources teachers can use as well as guidance for teaching about climate and energy topics. CLEAN is aligned with NGSS and has resources to help teachers create 3D learning units. This webinar is designed to target teachers in Washington state and help them navigate the new statewide climate education initiative. Time is provided for teachers to explore CLEAN for themselves through engaging activities. Request a webinar for your team or your organization: clean-at-colorado.edu. Watch the screencast on screen by pressing the play button. You can also download this video (MP4 Video 21.3MB Nov10 17). This webinar offers a guided tour of the CLEAN portal. Learn about the CLEAN collection of almost 700 climate and energy educational resources and the range of other supporting materials to help you effectively and accurately teach about climate and energy topics. Presenter: Anne Gold, Director CIRES Education Outreach. Watch the screencast on screen by pressing the play button. You can also download this video (MP4 Video 34.8MB Dec6 17). 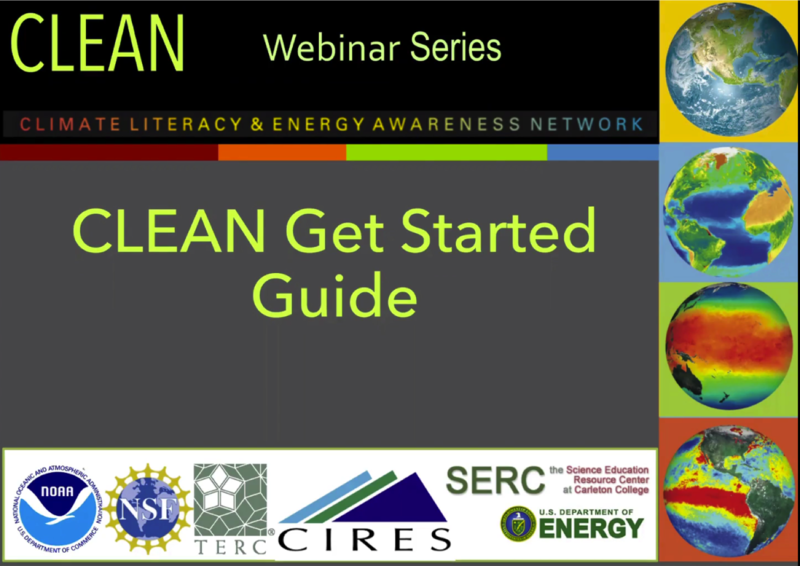 This webinar introduces the Climate and Energy Literacy Principles and how they are integrated with the CLEAN collection of climate and energy resources. 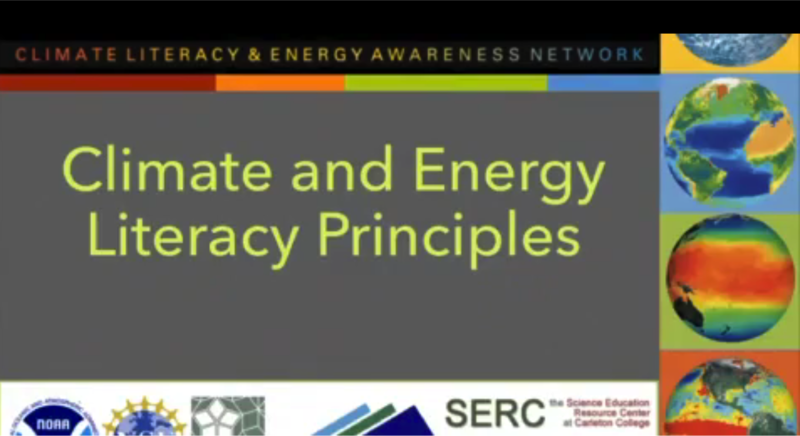 These principles provide the foundation for understanding the science behind climate and energy concepts. Presenter: Karin Kirk, Science Writer. Watch the screencast on screen by pressing the play button. You can also download this video (MP4 Video 12.3MB Nov30 17). Watch the screencast on screen by pressing the play button. You can also download this video (MP4 Video 24.1MB Dec5 17). 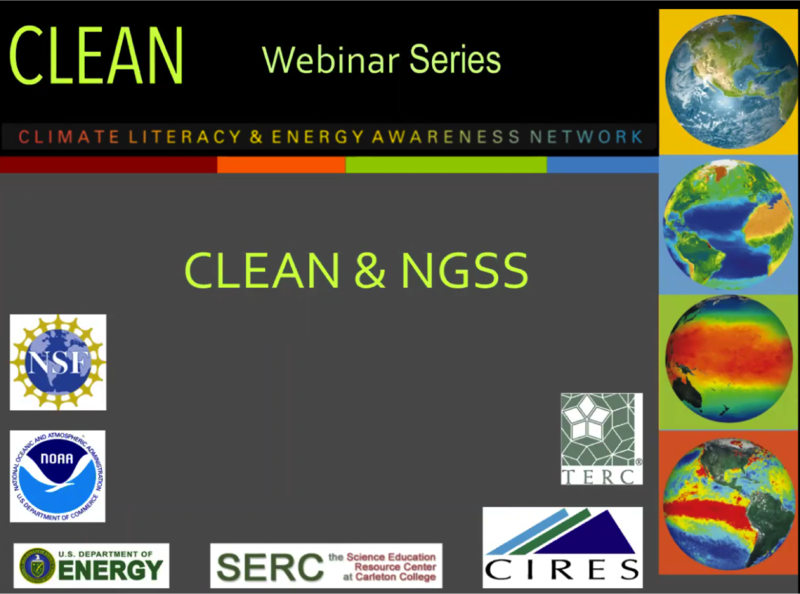 This webinar demonstrates how the CLEAN collection of educational resources are aligned to the Next Generation Science Standards (NGSS) and how CLEAN supports 3-dimensional learning. Learn how to search the CLEAN collection by NGSS climate and energy topics and at-a-glance standards tables. Presenter: Cheryl Manning, Earth Science Educator & NESTA President. Watch the screencast on screen by pressing the play button. You can also download this video (MP4 Video 44.2MB Mar26 19). Human impacts on the climate system are becoming increasingly evident, moving climate change from a topic that is abstract and faraway to one that is right before our eyes. It's our job to help students learn about our role in altering the climate, but it's important to do so in a way that's constructive and solutions-oriented. Educational materials from the CLEAN collection can help you navigate this essential topic. 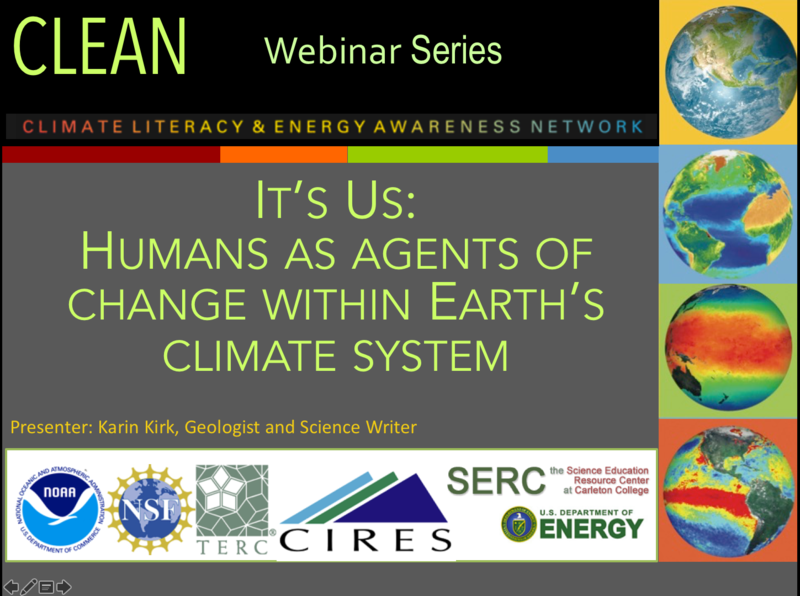 Presenter: Karin Kirk, Geologist and Science Writer. Watch the screencast on screen by pressing the play button. You can also download this video (MP4 Video 307.2MB Mar21 19). 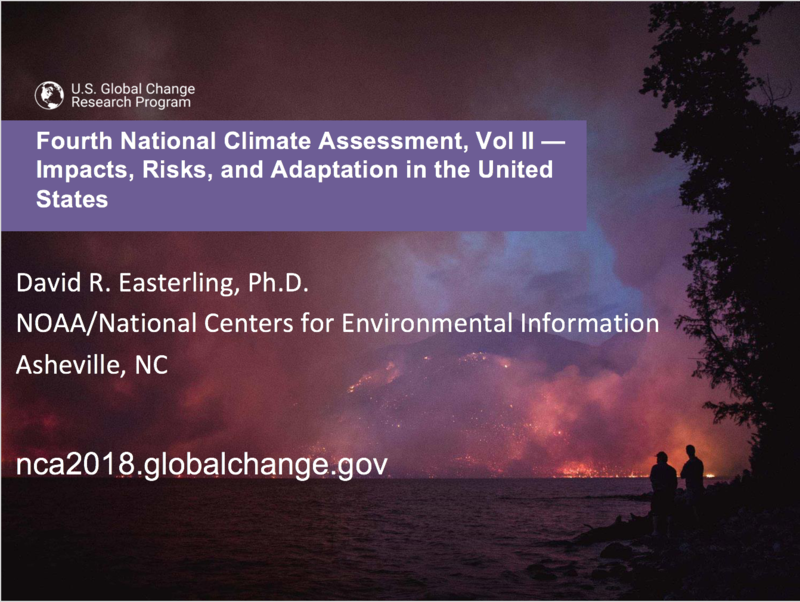 In this webinar, David Easterling (NOAA/National Centers for Environmental Information), Technical Support Unit and a Federal Coordinating lead author on the Fourth National Climate Assessment (NCA4), summarizes the key scientific findings from the NCA4. CLEAN educators discuss how teachers can use the NCA4 in their classrooms and point to CLEAN resources that support teaching these topics.